And even more time since I’ve updated the website. In January we discovered that we were expecting our first child. I have to do more research on the safety of using polymer clay during pregnancy, but chose to abstain in the meantime. Unfortunately things did not turn out as we hoped and the pregnancy ended in miscarriage. While we were quite unhappy with the diagnosis we also understand that things like this do happen. 25% of known pregnancies end in miscarriage, and I see it as fortunate to get the news very early on, before we ever saw (and got really attached to) a heartbeat on the Ultrasound. Events like this make you reevaluate everything in your life. And the sheer volume of half-finished projects on my craft table. But the constant reminder of unfinished projects was getting depressing. And yet a few more got boring when a more exciting idea came along. I dismantled all the half-finished critters and squished all the unbaked projects. Starting with a tiny Mickey Mouse experiment. Ideally 1-4 times a month. And yes, this fresh start also includes plans for new YouTube videos. Not subscribed to my channel yet? Sorry to hear about what happened! I doo hope you will get another chance soon again, or whenever you are ready. I am not an instagram subscriber, but would like to follow your journey, on the newsletter or fb. Looking forward to seeing more of you again! I post most frequently to Instagram but also share to FB so that you can still follow along. I hope you are feeling better, physically and emotionally. 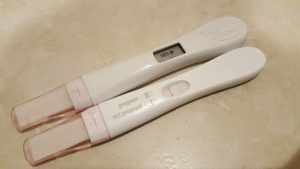 A miscarriage happened to me with my first pregnancy and like yours was very early on. But, a few years later I had a wonderful, healthy daughter. Whatever happens with you I hope it goes the way you want it to. BTW – is polymer clay safe while pregnant? I am happy to hear from you. I have always enjoyed watching your sculptures come to life. I look forward to seeing your new creations. I think a fresh start is a great way to stimulate the creative process. It was almost painful to watch you destroy those unfinished pieces!! (Gulp). Can’t wait to see your new creations!! Good luck on the pregnancy front. Leah, it’s good to hear from you again. I’m sorry to hear of your loss though.